Since 2003, Fit 4 Two® has helped women balance work and family while empowering others in their own communities. When a new Franchisee joins our team, they become part of a family. They benefit from training and ongoing support from their mentor, as well as the camaraderie of their fellow franchisees. It is the ideal opportunity for an entrepreneurial spirit who craves independence but wants the benefits of being part of a team. 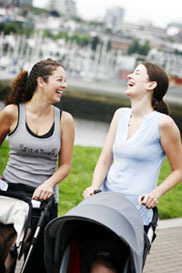 • Training & Support – Fit 4 Two® offers more training and support than any other pre or postnatal fitness franchise. Listen to Callie Camp, Fit 4 Two® Vancouver East, talk about her experience as a Fit 4 Two® Franchisee. Think a Fit 4 Two® Franchise could help you meet your family and career goals? Click here to find out how a Fit 4 Two® Franchise can help you fulfill your dreams. Sign up for our Fit 4 Two® Professional Newsletter. Stay up to date on all franchise opportunities Fit 4 Two® has to offer. Required items are denoted with a *. Listen to Callie Camp, Fit 4 Two Vancouver-East, talk about her experience as a Fit 4 Two Franchisee.